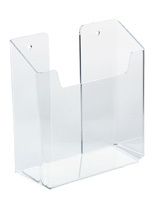 Do you need a lucite brochure holder that can accommodate standard sized literature? Do you want to keep your counters and tabletops free of clutter? This brochure holder that mounts to the wall is the solution. 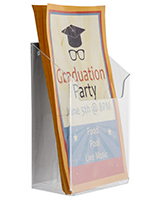 This single pocket, half height dispenser for 4" wide flyers is an effective tool used to offer free pamphlets, applications or other 4" x 9" trifolds. 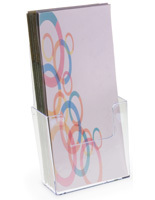 This brochure holder is made with clear acrylic which enables viewers to see the entire contents. The cutout in the front of the pocket keeps the flyers upright without obstructing the view of the pamphlets. 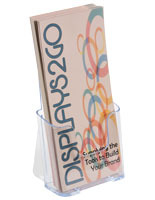 The brochure holder is just over 1" deep, allowing for a generous amount of materials to be displayed. The pre-drilled mounting holes are hidden when the unit is filled. 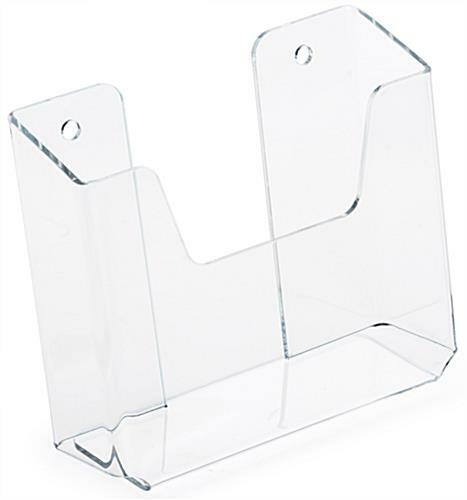 This brochure holder is a great way to condense all of your literature and give your clients a one-stop shopping location for all marketing materials. Why have literature lying flat on a table or counter when your can elevate it and bring it to the attention of your visitors and patrons. 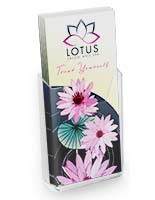 This brochure holder, also called a literature dispenser, can be used everywhere from retail stores, trade shows, lobbies, offices, schools or reception areas. 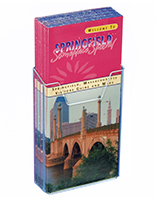 The small overall size allows users to mount multiple units in a row to offer a wide range of pamphlets or other take-home informational reading materials. 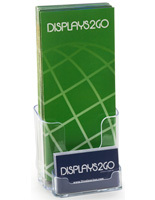 This brochure holder that is made with quality clear acrylic is suitable for most any type of commercial environment. Use this literature rack to keep an office space looking neat and orderly. 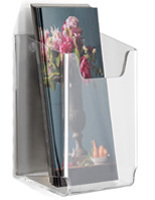 This brochure holder mounts easily and securely using either your own screws and anchors or the supplied sticky pads. 4.1" x 3.3" x 1.3"